HEADWAY, a new turf fungicide launched by Syngenta containing two world-leading systemic active ingredients, is the first ever multi active to give control of both foliar and soil-borne fungal diseases. The exciting new easy-to-use solution provides an extremely cost effective combination of both azoxystrobin and propiconazole. The complimentary power of two actives in one pre-formulated product gives improved performance and increased flexibility, for greater security throughout the growing season. HEADWAY is approved for control of all key foliar and soil-borne turf diseases, including Fusarium Patch, Take-All, Anthracnose, Dollar Spot and Leaf Spots. Trials have also shown additional effects on Fairy Ring (Basidiomycetes), Red Thread, Rust and Brown Patch. Syngenta Turf & Amenity Technical Manager, Dr Simon Watson, reports that in independent trials, HEADWAY achieved virtually 100% control of Fusarium eight weeks after application, giving 48% better control than the average of comparative fungicides in the trial. HEADWAY was still giving better disease control after 12 weeks, than iprodione or myclobutanil had achieved at four weeks. Commenting on Michigan State University fungicide trials leading US turf researcher, Dr Joe Vargas, reported HEADWAY treatments as being "especially efficacious". 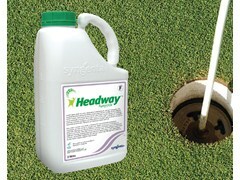 The unique HEADWAY double-action formulation has been especially created to be safe and gentle on turf and for rapid uptake of the systemic active into the plant. Dr Watson highlights the fast movement within the plant targets disease more effectively. "The significantly smaller particles in HEADWAY continuously redistribute the powerful actives through the plant to protect the growing leaf surface. Systemic movement replenishes the fungicide protection after mowing, for incredible long-lasting results." HEADWAY is approved at the low rate of 3 litres per hectare, using flexible water volume of 250 to 1000 l/ha. The low application rate and easy to use formulation means faster tank mixing and operation, as well as fewer containers to dispose of, adds Dr Watson. "It's the simple, cost effective one-can solution for twin-action disease control". HEADWAY is distributed in the UK and Ireland by Scotts Professional and available exclusively from Sherriff Amenity in England, Wales and Scotland.